People with diabetes can develop nerve pain or loss of feeling over time. 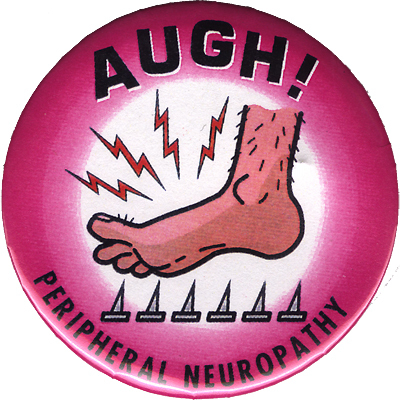 It is estimated that 60-70% of diabetics have some form of neuropathy, whether they feel it as numbness, burning, tingling or nothing at all. 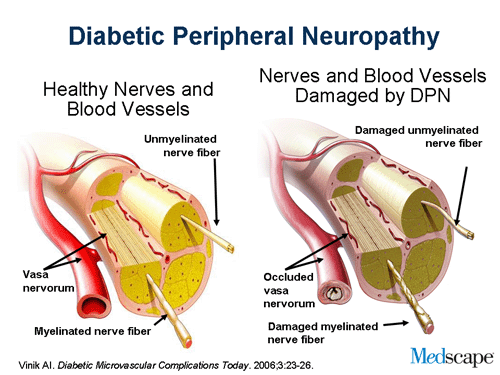 Generally, the longer you have diabetes, the more likely you are to suffer diabetic nerve pain. Metabolic factors, damage to blood vessels, inflammation in the nerves, inherited traits, and lifestyle factors (like smoking) all contribute to the development of neuropathy and pain. Experts from The Center for Podiatric Care and Sports Medicine give their best advice for how to control this pain. “I think the most important tip would be: prevention,” says Dr. Nadia Levy, a diabetic wound care specialist at The Center for Podiatric Care and Sports Medicine in NYC. “Do not let your blood sugar level get out of control. Check it regularly at home and if you notice that it is trending too high — notify your managing doctor immediately.” Your sugar goals should be 70 to 130 mg/dL before meals and less than 180 mg/dL after meals. WebMD cited a 2006 study conducted by the National Institute of Diabetes and Digestive and Kidney Diseases, which showed that strict blood glucose control with intensive insulin therapy lowered the risk of peripheral neuropathy by 64%. Your local pharmacy has products containing Lidocaine or Capsaicin, which have helped nerve pain in some diabetics. One UK study found that “Capsaicin, either as repeated application of a low dose (0.075%) cream, or a single application of a high dose (8%) patch may provide a degree of pain relief to some patients with painful neuropathic conditions,” although they admitted outcomes may vary. 3. Try medical foods for diabetic nerve pain. “Since prescription medications for nerve pain can have unwanted side effects, ask your doctor whether a medical food such as Metanx might be an option,” NYC Podiatrist Dr. Katherine Lai advises. A study by Tulane University found that Metanx provided short-term symptomatic relief for type 2 diabetes neuropathy sufferers. More studies are needed to confirm the long-term effectiveness. 4. Be honest about the pain. It’s important to speak up if you have diabetes and feel any pain, numbness, or tingling in the foot. It may not seem like a big deal at first, but it can be the first signs of neuropathy, which means reduced circulation and ability too self-heal. From there, even minor wounds can become infected sores that may lead to gangrene or amputation.